In General, a single widget file ej.web.all.min.js file is used to load any of the Syncfusion widgets – but with the introduction of new AMD modules, it is not necessary to refer the entire script files in the project – just adding the script reference for RequireJS is enough – as it loads only the required widgets scripts at the required time. 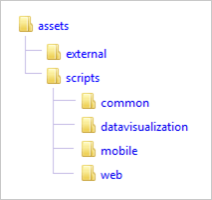 The local module structure is as follows – where all the widget modules are placed under the assets folder. For detailed information on assets folder structure, refer here. For version lower than 13.3.0.18, refer this Knowledge Base. From version 14.3.0.49, we have removed the jquery.easing dependency from our components. 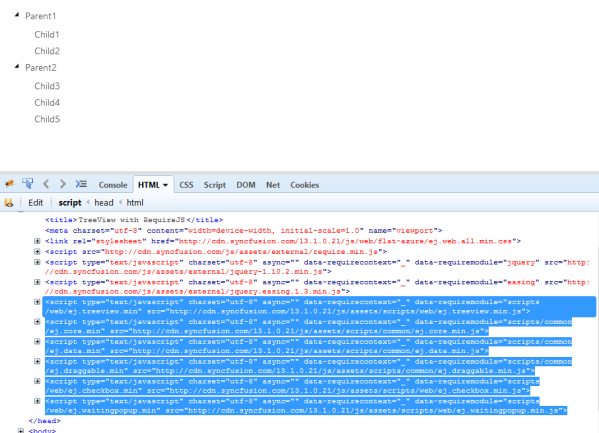 For version lower than 14.3.0.49, you need to refer the jquery.easing as additional dependency. The above specified CDN links can also be replaced with the local scripts and Stylesheets. To do so, simply copy the assets folder from the installed location on your machine into the sample application directory and then refer it in your sample code as shown below. For referring the stylesheets locally, refer here.